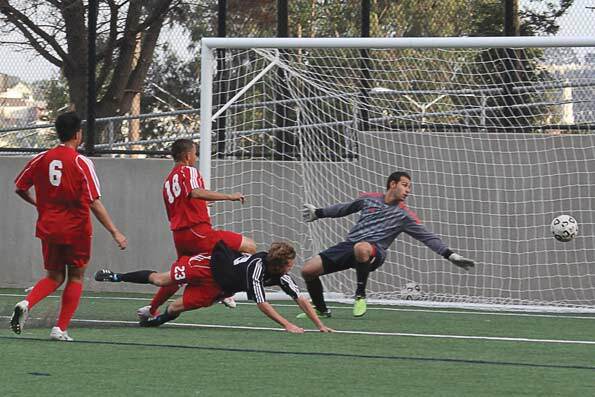 City College didn’t underestimate Las Positas College Oct. 14, instead they sailed past the Hawks proving why they’re the current best scoring margin in California. On the season, the Rams have only allowed 10 goals. With a scoring margin of +35, they quickly dismantled their opponent, 5-0, to take second place of the Coast Conference North Division. Head Coach Adam Lucarelli said he is very happy the Rams had an outstanding performance, adding another convincing victory at home. In the eighth minute, Rams’ freshman Bryant Izaguirre was quick enough to steal a Las Positas pass and pulled a counter-attack, scoring on goalkeeper, Jesus Ruiz to take an early lead. City College doubled their score in the 20th minute when defender Emmanuel Rojas sent a long pass precise enough for left-wing midfielder Wu Lo to take a shot across the goal. The Rams never stopped seeking the offense as they continued to create many scoring opportunities. Rams’ freshman forward Izaguirre, with a smart move, came up behind a player and scored his second goal of the afternoon. Ball possession continued for the Rams in the second-half with the help of freshman midfielder Jesse Cineros. His accurate passes opened the field and created clear scoring chances. After a cornerkick in the 63rd minute, freshman defender Edwin Garcia took the rebound passing to freshman forward Arnulfo Garcia who just had the work of tapping the goal in. 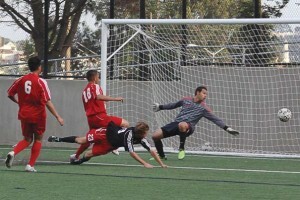 The Hawks had an opportunity late in the second half to spoil the shutout with a penalty kick, but was saved by City College’s goalie. The Rams would capitalize with one final goal for the game. Garcia, forward, who scored two goals in the second half, said he was also very happy he did his job well, which helped the Rams increase their scoring record. City College faced Mission College for their next game in Santa Clara, Calif., on Oct. 16, but results were not available for publication. The Rams will continue their road trip, travelling to Evergreen Valley on Oct. 21. Kickoff starts at 4 p.m.